This will hopefully be the first of many roundtables hosted by The Junto, in which a bunch of young whipper-snappers take aim at various topics of early American history, with the occasional response from seasoned scholars to set us straight. This particular roundtable, which will hopefully set a pattern for others to follow, includes contributions every day this week, each on a different topic related to the broader theme, and then a conclusion/response next Monday. We hope these roundtables, starting with this one on the current state of political history, will start a fruitful discussion both on the blog and elsewhere. In 2005, Chris Beneke published an essay in Reviews in American History titled “The New, New Political History.” This label did not originate with him—indeed, one of the chapters in the book he was reviewing used the same description—but it was meant to capture the arguably fresh take on early American politics. The editors of Beyond the Founders, Beneke wrote, “enter a nearly decade-long discussion on the direction of political history.” Was the field thriving or faltering? Well, he reasoned, it depended on how you defined the field. And after looking at this manifesto-volume, Beneke concluded that the movement was diverse, scattered, and unsystematic, yet promising. In the face of the ever-constant “founders chic,” a continuation of America’s fascination with a small group of people who allegedly embodied America’s pride and glory, this historical movement sought to widen the scope and centralize the peripheries. Sometimes, for academics, the Joseph Ellises and David McCulloughs of the world are not quite enough. Of course, historiographical movements are best understood in relation to the periods they are succeeding, and not just the contemporary founders hagiography. The “new political history,” which arrived in the 1960s and 1970s, was steeped in the “social turn” of the historical academy, and excelled in quantifiable aspects of America like voting, parties, and elections; as a result, it privileged the more synchronized political manifestations of the Jacksonian period than the more tumultuous, and dynamic, atmosphere of the early republic. The many superb works from this period laid a strong foundation of elite/common interplay, and helped students of the field to navigate the social and political worlds of the newly United States. The historians represented in this volume recognize both the power the founders had to shape subsequent American history and the importance of political showdowns of the 1790s. Nevertheless, they emphasize how in an era of postrevolutionary ferment and retrenchment, uneven and contradictory democratization of public life, geographical expansion, and economic upheaval, politics took multiple shapes at interlocking local, state, regional, and national levels. The task of constructing (and for some, contesting) relatively new political institutions hardly ended with the ratification of the Constitution or with the turbulent 1790s. Beyond the founders, in terms of people and in terms of time, lay struggles to demarcate the identity of the citizen, the modes of political action, and the changing nature of the political itself. So, like I said: messy. This new emphasis on the “development of democratic practices” and “forms of culture,” rather than ideological evolutions, bequeathed a framework that expanded both subjects and content. It also sought to integrate elite and common, founders and followers, hierarchy and plebeians, and forge a synthetic narrative that would consume the many isolated and disjointed examinations of young America’s political culture. Almost another decade has elapsed since Beyond the Founders was published, and many volumes, both monographs and essay collections, have followed in its footsteps. Indeed, the methodologies introduced in the 1990s, and embodied in Beyond the Founders, is now, for the most part, understood as the field’s orthodoxy, and nearly every graduate student in American political history is forced to come to terms with its methods and conclusions. There have been numerous benefits of the new approach: a more cohesive synthesis of high- and low-culture in the early republic, a broader sense of cultural assumptions across demographics and geographies, and the better integration of women, African Americans, and Indians in the newly United States. Yet no movement is without its flaws and weaknesses; nor does any historiographical label last forever. (Especially when a new generation must go through the ceremonial ritual of making a strawman of their elders and cultivating a proud image of their “new” and “cutting-edge” work.) This week, we at The Junto will take a look back at the most recent generation of political history and highlight the strengths and weaknesses, as well as posit where the field may go from here. (Though “The New New New Political History” just sounds awkward.) To offer an eclectic glimpse, our roundtable, as currently constituted, will include looks at race, gender, economy, state formation, and the public sphere. We will then (hopefully) be privileged to have a response from Andrew Robertson. We hope you will participate in the comments, extend the dialogue further, and help us turn the world upside-down. Or at least help us have a good time. Chris Beneke, “The New, New Political History,” Reviews in American History 33, no. 3 (Sept. 2005): 314-324. William G. Shade, “Commentary: Deja Vu All Over Again: Is There a New New Political History?” in Jeffrey L. Pasley, Andrew Robertson, and David Waldstreicher, eds., Beyond the Founders: New Approaches to the Political History of the Early American Republic (Chapel Hill: University of North Carolina Press, 2004): 387-412. Beneke, “The New, New Political History,” 315. The still-foundational works of Alfred Young and Rhys Isaac from the period are perhaps the best examples of this movement. 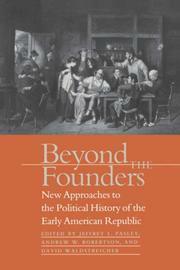 Pasley, Robertson, Waldstreicher, “Introduction,” in Beyond the Founders, 3. Perhaps the most notable collection, another manifesto for “Founders beyond the Founders” is Ray Raphael, Alfred F. Young, and Gary Nash, Revolutionary Founders: Rebels, Radicals, and Reformers in the Making of a Nation (New York: Knopf, 2011). I’m presently writing separate books about the development of the Jacksonian Democrats and the 1840 election, so a lot of my recent reading has been tracing the arguments that Shalhope, Formisano, the two Richard McCormicks, Silbey, and Co. had in the 1960s-1990s. I’m just now re-reading some of the New New Political History and its take on political culture. I’ll be interested to see the directions that this roundtable takes. What made and continues to make this inchoate moment so interesting to me are similar, almost parallel movements occurring in business history (going beyond the Chandlerian framework) and legal history (pushing Hurstian law-in-action into social/cultural fronts). Nice post Benjamin. I too am looking forward to the discussion. As someone who’s written about political culture in the colonial period, I’ve found some of these “turns” in early American political history interesting. Specifically, I’ve noticed how the “new political history” and the “new, new political history” each focus almost exclusively on the Revolutionary and early Republic periods. Why the disconnect? That’s always made me feel like there’s still too much teleology at work, no matter how many different “founders” historians find. John, for some reason, I missed this comment before. But, also working in the colonial period, I’ve always thought exactly the same thing about the NNPH and wrote about it in the final post of the roundtable. Scholars have begun taking a ‘new’ look at both the politics and economy of the early modern/ modern worlds. Political history, once part and parcel of grand narratives, has taken a closer look at cultural, contingent, fringe, etc. effects on political history. Reblogged this on roads to modernity.